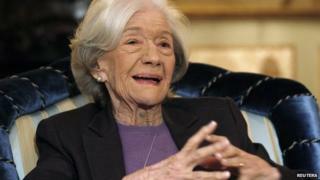 Award-winning Spanish novelist Ana Maria Matute has died at the age of 88. The author - who was regarded as one of Spain's greatest post-Civil War writers - died of a heart attack in Barcelona, her son told Reuters. Matute had won almost all of Spain's major literary awards, including the Cervantes Prize, the Spanish-speaking world's highest literary honour. Her best-known works include Los Abel (The Abels) and Los Soldados Lloran de Noche (Soldiers Cry By Night). Matute and many of her contemporaries, who were scarred by the 1936-1939 war, were dubbed the "generation of the frightened children". Her writing depicted the devastation of rural, war-torn Spain from a child's perspective. During the Franco regime, which ended in 1974, much of her work was censored and she was blacklisted from writing in newspapers and magazines. "They called me irreverent, immoral, they twisted everything," she said in 2011 at an exhibition showing how official censors changed her work. Matute is also known for her children's books and young adult novels, including Los Ninos Tontos (The Stupid Children) and El Verdadero Final de La Bella Durmiente (The True Story of Sleeping Beauty). The author did not write for most of the 1970s and 1980s after suffering from depression. When she returned, she produced a trilogy of medieval fantasy stories. Her latest book, Family Demons, was due to be published in September.